I think this was taken in about 1990. 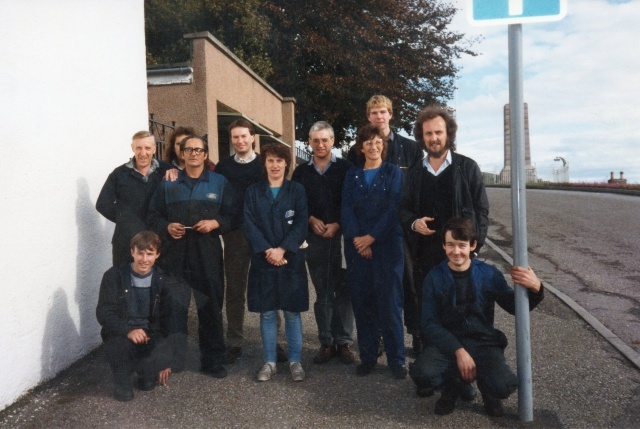 Hugh Maciver in middle at back with glasses and Stenia Cosgrove in front with blue jeans on. Margaret Macpherson in front of Gavin or Gordon Sutherland, and I think Gavin Gunn kneeling on front right. Jim Butler with the beard. Johnnie Sutherland from Alness is at the front sitting down - son of John Sutherland who used to work there for many years. Frank Murray from Alness is beside Duncan Maclean. I also think Edna, Johnnie Sutherland's mother, worked in the office in Frews at one time. John Sutherland (Johnnie's father) can be seen 2nd left in picture #1060. Edna never worked in Frews, but her father Jimmy Sinclair did, for many years. Hi Mary, I knew I had seen Edna around Frews, that explains it. I think it may be Jimmy Sinclair (aka Jimmy Orkney) shown in picture #1056. Not Jimmy Orkney in this picture. I think two are Alan Edgar and wife Hazel. Definitely Hazel and Alan Edgar in picture #1056. I thought it may be Jimmy Orkney in the background. Bill Hadden from Tain, 2nd from left, standing beside Duncan Maclean, then Gus from Evanton.